LaUnched in 2012, this homeware brand won the Elle Deco International Design Award a year later, for their camel traders print (inspired by Rajasthana��s Pushkar Camel Fair) in the bedroom category. Safomasi, by Sarah Fotheringham and Maninder Singh, has recently launched its latest collection called Kawaii, inspired by Fotheringhama��s four-month stay in Japan. In the past, they have offered three collections inspired by their different experiences of India a�� like Keralaa��s romance town, Allepey, to the colourful and quirky Mithai collection which documents the varieties of sweets found in India. 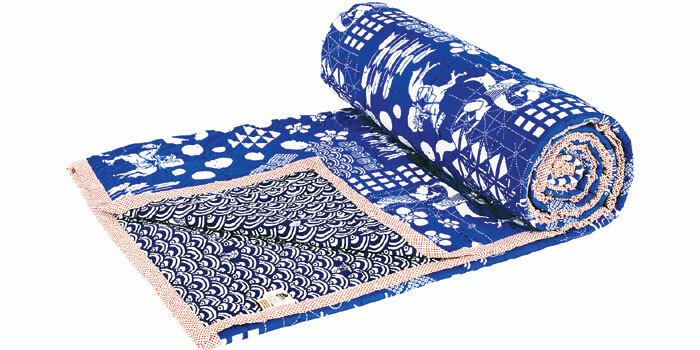 With Japanese manicured gardens, Maneki-neko (lucky cats) and eccentrically-styled poodles, Japana��s vibrant culture and lifestyle finds its place in Safomasia��s quilts, cushions, tea towels and pouches this season. Their napkin sets featuring origami cranes, based on the Japanese belief that a 1,000 cranes bring good luck, make for an interesting find. a�?From illustrating the famous Shibuya crossing, which is one of the busiest intersections in Japan, to attending a wrestling match and etching Sumos on tea towels, Sarah has done it all,a�? says Singh, whoa��d met Fotheringham at a photo shoot in Delhi after returning from Melbourne in 2010. Given Fotheringhama��s background of an artist and illustrator, and Singha��s experience as an event manager at the Fashion Design Council of India for three years, their collaboration covers both the design and marketing aspects.